C.S. Lewis, the writer of the famous Chronicles of Narnia, tells his conversion story in the book entitled Surprised By Joy. In this autobiography, Lewis tells us that he was seeking anyway in which he would be able to flee from God. First he tried pantheism, saying that God was all things. In believing this, he wanted to have God under his control. He tried atheism next, simply denying that God existed. Then he was forced to believe that God existed. However, he didn’t want to believe in the God of the Bible. Finally, God wrestled him to the ground, and forced him to admit that he needed God’s grace. Does God wrestle with us in this way? I think oftentimes, that even when we do believe in the God of the Bible, we don’t let God control our lives through the Scriptures. We put up a fight instead. You could say that Jacob’s entire life was one of resisting God. You could also say that Jacob’s life was characterized by God wrestling with him, pursuing Jacob with relentless grace until Jacob was finally wrestled to the ground. In our passage we come to the climax of Jacob’s entire life. This is the most important thing that ever happened in his life. This event of wrestling with his unknown assailant marked the transition in Jacob’s life from being a self-help guru to being led by God, and having God help him. Many people think that the main point of this episode in Jacob’s life is that we should wrestle with God in prayer. That is certainly one of the applications that we can take from this story. However, that is not the main point. The main point is that when God wrestles us to the ground, and puts our entire life out of joint, then God gives us grace. We can see this especially in Jacob’s life being a foreshadowing of Jesus Christ. Let’s look carefully at our passage. Remember where we are. Jacob is about to meet Esau. He has selected a huge gift to give to Esau, and has prayed that the Lord will deliver him from the hand of Esau. Our passage starts out by saying that Jacob winds up all alone. He has sent all his family ahead of him across the Jabbok river. He decided to remain behind. What Jacob doesn’t know is that his most formidable adversary is not Esau, but God. He is going to meet a man who will not say anything to him (since God has already said everything He needs to say, and still Jacob is without faith). Instead of saying anything, this man will simply throw himself at Jacob. This might strike us as a very strange way of answering Jacob’s prayer. Jacob prayed that God would deliver him out of the hand of Esau. And how God does that is to wrestle with Jacob and cripple him! What is going on here? God is making Jacob realize that Jacob must fear God rather than men. He must fear God more than he fears Esau. We know that this man who meets with Jacob is God. But that raises a rather difficult question for us: if this man is God Himself, how come Jacob can actually wrestle with this man, and not be thrown down immediately by the infinitely superior strength of God? The answer lies in the fact that God accommodated Himself to Jacob’s strength. We remember that though Jacob is a strong man, yet he is a mere mortal. That is why God gives Himself a handicap. He wants Jacob to realize that even if God handicaps Himself, Jacob cannot prevail against Him. It says in verse 24 that the man wrestled with Jacob until the break of day. The timing of this wrestling is extremely important for our understanding of the passage. The man wrestles with Jacob until the break of day. He then wants to be dismissed at the break of day. At night, you see, it is impossible for Jacob to see his opponent. One is reminded of the verse that says, “No one may see God and live.” The man with whom Jacob is wrestling is God Himself. Therefore, the man tells Jacob to let Him go. That request is for Jacob’s own good. Another important thing to notice here is that, though the passage says that the man did not prevail against Jacob, yet the man puts Jacob’s hip out of joint. We don’t know how hard the man touched Jacob to put that hip out of joint, but we do know the result. It was painful. In the same way that God touched Jacob’s life, putting it out of joint, God also touches our lives, putting them out of joint. The reason He does that is that we are so often too sure of ourselves, and all too willing to trust in ourselves. We are blinded by our own self-sufficiency into thinking that we don’t need God, and that the worst enemy we have is our brother. However, unless we trust in Christ alone, and not in ourselves, for salvation, we are God’s enemy. So putting Jacob’s hip out of joint was a mercy, a grace from God, not a mark of hatred. God could justly have killed Jacob on the spot simply for daring to wrestle with Him. That would have been fair whether Jacob knew who He was or not. However, God takes a much gentler tack on Jacob, and merely dislocates Jacob’s hip. There was another man who wrestled with God. He also would wrestle all the night through. He also would use up all his energy and strength trying to prevail. However, He would get a whole lot more than His hip dislocated. He would have his soul suffer the pains of death and hell itself. His soul would be dislocated into Hell. The man wrestled with God in the Garden of Gethsemane. Only that time, God did not grant a blessing but a curse. Cursed would this man be for the sins of His people. God would pour out His wrath on Jesus Christ so that He could deal with us by grace. Do we trust in this Jesus who has had His soul dislocated? Do we trust in Him rather than ourselves? If we do, we will have a new name given to us, much as Jacob had a new name given to him. The man asks Jacob what his name is. Jacob admits the justice of Esau’s claim that Jacob was rightly named “Grasper by the heel.” The name speaks more of the seed of the serpent than of the seed of the woman. When Jacob admits to the justice of his name, then at that point God gives him a new name: Israel. Israel means “God strives,” or “God struggles.” It refers to this very event wherein God struggles with Jacob, and has to finally dislocate Jacob’s hip in order to get through to Jacob. However, we see in the rest of Genesis that Jacob is often still called Jacob. If his new name is Israel, why is he still often called Jacob? The answer to that question gets to the heart of what it is like to be a Christian. Though we have a new name, that of “Christian,” yet we still have remnants of that old nature dwelling in us. We are simultaneously sinners, and yet justified. Don’t miss this small detail in verse 31: that the sun had risen on Jacob. That is not just talking about the sun. It is talking about Jacob’s spiritual state. It is talking about Jacob’s own resurrection, as it were. You might remember that in 28:11, the text says that the sun had set. He was in his own period of darkness all the time he was with Laban, just as the nation of Israel was in darkness all the time they were under the reign of Pharaoh. But when the sun rises, there is hope for men. It rose upon Jacob; it rose upon Israel; it rose upon Jesus Christ; and it can rise upon us as well. Do not wait to close with Christ until God has to dislocate your life. Do it now. Know also that if you are a Christian, God may have to dislocate your life so that you will listen to Him. If that happens, then do not resist. Do not fight against God. Let Him mould you into that image of Christ that He has always wanted for you. This will usually mean denying ourselves. We might have to deny ourselves that standard of living that we crave so much, and that we absolutely have to have. In fact, we are willing to sacrifice family time and church priorities in order to have that standard of living. We should not do this, my friends. This passage also does tell us to be persistent in prayer. It is there that we should imitate our Lord Jesus on the night of Gethsemane. During our trip, on the way home, we had an incident that I will always remember. We were in Dallas, trying to get on the flight to Minneapolis. There were very few seats left on the plane, and there were a lot of people who were ahead of us on the priority list. There did not seem to be any way that we could get on that plane. Furthermore, there were not flights that looked any better for the entire next week. Rerouting into Chicago or St. Louis didn’t look any better. So we prayed, and we prayed. I spent the entire time from the moment it looked bad until the moment of truth in prayer. God answered us by getting us on that plane. My brother-in-law Craig was dumbfounded. God had used a gate change and some bad weather in the Northeast to delay travelers such that there were enough seats for us to get on the plane. Prayer works. God uses our prayers to accomplish His purposes. The main purpose of God’s using our prayers, of course, is to strengthen our faith. In prayer is the one place where we are to wrestle. That is, we should not resist our Lord when we pray, but rather we should be persistent. We see that in Jacob’s own example, as well. We see him wrestling with the Lord in prayer. So what we see is Jacob being crippled by the Lord such that grace may abound. 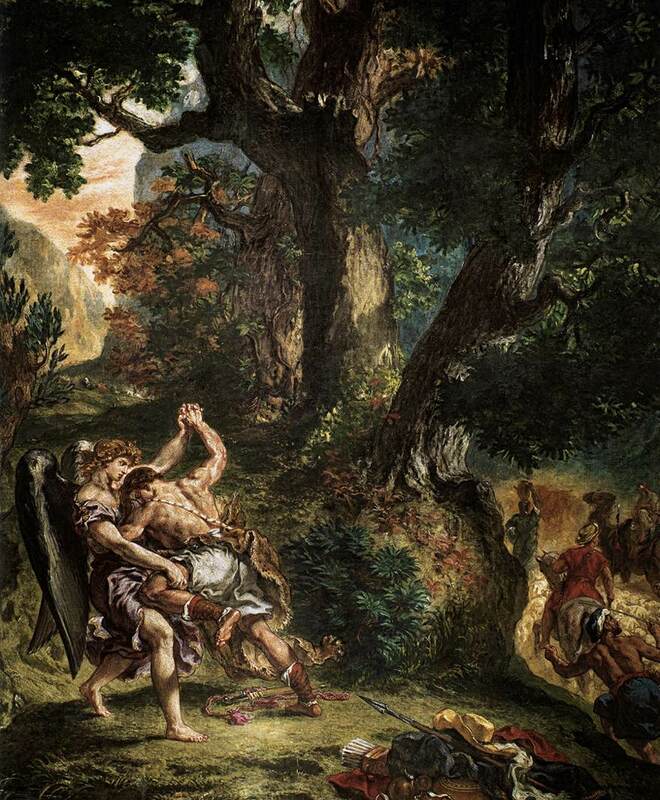 This is a story of God wrestling with Jacob, and exercising His sovereign grace in a very unusual way by crippling Jacob, wrestling him to the ground. Hallelujah. While I agree that God indeed wrestled with Jacob … it is the pre incarnate Christ that did so … in hand to hand combat … he named the place (Peniel,) the face of God … just as Abraham witnessed the Lord when He came to him with the promise of a son.